What is Better than Zero? 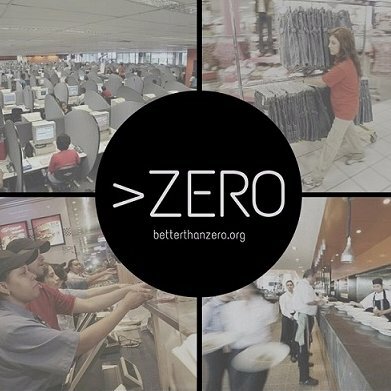 Better than Zero is a grassroots campaign of retail and hospitality workers who are sick and tired of poverty pay, insecure contracts and indignity in the workplace and are doing something about it. With the support of the STUC and various affiliated trade unions we aim to educate workers about their rights and give them the resources and collective confidence to take action to end exploitative practices. Why does Better than Zero need to exist? Better than Zero is necessary because exploitation is most rife in those industries where trade unions are weakest: hospitality and retail. Our short-term role is to educate workers as to their rights at work and inspire them to do something about their situation through direct action. In the long-term we want to grow trade union membership in these industries to levels at which we can collectively bargain for significant improvements in industry-wide wages and conditions. How many people are on zero hour contracts in Scotland? The most recent figures for Scotland are 57,000 (Oct-Dec 2016), but this may not cover all the different strands of precarious work. Zero hour contracts are seen as flexible by some people - what's wrong with them? Zero hours contracts could only be flexible if the relationship between the employer and the employee was a fair and equal one in which the worker could genuinely pick and choose their hours without retribution for turning down hours on busy days. In reality what they allow employers to do is keep a bank of workers on standby to cover busy periods without having to pay sick pay. They can also be used as a way to sanction those who “let the team/manager down” - we regularly represent zero-hours workers who have been informally sacked by not being given any more hours. CASE STUDY Nicole is a young worker who was asked to work an unpaid trial shift at Aldi. She describes the experience as "slave labour", commenting: "They use you to get the shop ready for opening time and get annoyed if you make any mistakes, even though you've not been trained. They abandon you and moan if you've not completed the million tasks to do." What fundamental rights do workers have when on a zero hour contract? Minimum wage: regardless of how many hours a week you get you are legally entitled to the minimum wage of £7.50 p/h if you are 25 or over, £7.05 for 21-24 year olds, £5.60 (18-21), £4.05 (16-17), £3.50 (Apprentices). A contract: Every employee (including agency workers) is entitled to a written statement of particulars after 12 weeks of employment. This should include your rate of pay, holiday entitlement and notice period. Equal treatment: The Agency Worker Regulations entitle every worker (after 12 weeks of work) to the same basic terms and conditions of employment as if they had been employed directly by the hirer. This includes pay, hours, rest breaks and annual leave. Right to work elsewhere: In 2014, the UK government made it illegal for zero hour contracts to include exclusivity clauses. This means your employer can't prevent you from being employed elsewhere. Holidays: All workers are entitled to 5.6 weeks paid annual leave. To calculate your entitlement, you multiply days worked by 5.6: e.g. 3 days a week = 16.8 days per year. Sick pay: After three days of continual sickness, every worker is entitled to £88.45 statutory sick pay for up to six months. This will be pro-rataed for part time workers. Case Study Sarah worked as a housekeeper at a Holiday Inn. She claims her employer "didn't care about staff, bottom line". She injured her shoulder and ended up needing a physio. She said: "I wasn't given a proper induction so I didn't report how I did my injury. They never gave me an induction of where to go for first aid or told me who the designated first aider was." What can you do if you're concerned about an aspect of your zero hour job, either for yourself or someone else? Join a trade union and encourage other employees to do so. Raise a collective grievance outlining the issues concerned. Get all colleagues affected to sign it. Turn this grievance into a campaign. There's no point sending it on to management if they fix the problem only to take credit for it. Use collective grievance as an organising tool to unionise other workers and to give confidence to the idea of workers improving working conditions together. What's the best way to campaign for the abolition of zero hour contracts? Again - join a trade union as Better than Zero is a campaign group, not a union. We can support you in your workplace to take action against unscrupulous employers and to change exploitative practices but only a trade union can provide the kind of collective voice required to improve conditions. What's the working time directive? The working time directive is a binding piece of European legislation which commits employers to a maximum average working week of 48 hours (over a 17 week period). Which trade union should I join? It depends where you work. Many workplaces and companies have recognised unions who already negotiate wages and conditions, but the vast majority don't (particularly in the retail and hospitality sectors). If there's no recognised union in your workplace, you can use this handy list on the STUC website to work out what's best for you. Unite Hospitality is the newest campaign from the largest private sector union in the country which seeks to support and unionise workers in the hospitality industry. Our aim is to equip workers with the knowledge, skills and collective confidence to challenge exploitative practices and transform the hospitality industry alongside the workers within. The centrepiece of this campaign is the Fair Hospitality charter (see link), a list of reforms needed to transform the sector for the benefit of employees and customers. The list includes the real living wage, an end to discriminatory youth wage rates and stricter anti-sexual harassment policies for the workplace. Are there any specific employers to be aware of? G1 Group: In 2015 they were fined £45,124.00 by HMRC for failing to pay the minimum wage to 2895 workers. They continue to use unpaid trial shifts at many of their venues and deduct well-earned tips for breakages, spillages and walk-outs. In one particular incident at The Social in Glasgow one worker was docked all of her tips and had to withdraw £90 from the cash machine to cover a walk-out of customers. Sports Direct: Were forced by Unite the union to pay back £1.1 million in backdated wages to thousands of staff who weren’t even paid the minimum wage. 75% of their staff are on zero hours contracts. Their main distribution plant in Shire brook has been described as a Victorian workhouse with women being forced to give birth on site due to failure to pay maternity leave. Macdonald Hotels - According to the ‘rate your employer’ website GlassDoor, the largest independent hotelier in the country is also the worst to work for. Having represented workers in the chain we know of systematic bullying and victimisation, workers having their tips taken off them and huge amounts of un-paid overtime.